After a six-month mission on the International Space Station, Tim Peake has landed safely back on Earth. The astronaut made history as the first person representing Britain to live on the International Space Station. Early on Saturday, he said goodbye to his crewmates on the ISS, and set off on the journey home, along with two other astronauts - Tim Kopra from America, and Yuri Malenchenko from Russia. Colonel Tim Kopra hands command of the ISS over to his colleague Jeff Williams before heading home with Tim Peake and Yuri Malenchenko. Jeff is now in charge of the space station. 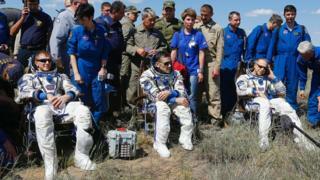 Tim, Tim and Yuri say farewell to their fellow astronauts who are staying on the space station. They enter the Soyuz capsule, which is the space craft that will bring them home. The crew have to wait for three hours before the capsule leaves the ISS and starts the journey back to Earth. They're all squeezed into seats made especially for them in the tiny spacecraft. 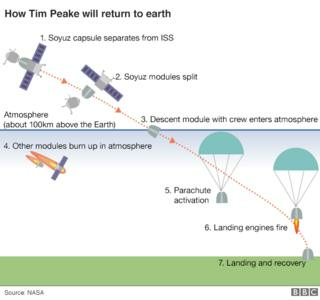 The Soyuz capsule carrying Tim Peake and his two crewmates undocks from the ISS, to bring them back to Earth. 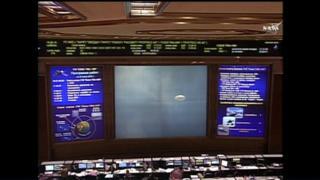 The ISS's new commander, Jeff Williams, rings a bell to signal their departure, saying "Soyuz-TMA departed. Farewell gentlemen, see you on the ground". 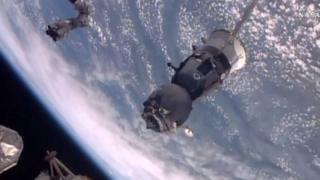 After undocking, the Soyuz fires two 'separation burns', which push it safely away from the ISS. It needs to get about 12km away from the ISS before it can start its descent to Earth. Here's the plan for getting back to Earth. Once it's drifted far enough away from the ISS, the tiny Soyuz spacecraft starts its journey down towards Earth, racing at 25 times the speed of sound. The craft goes so fast that the air can't get out of its way fast enough, so it compresses and gets very hot. But the astronauts are protected inside by a heat shield. The Soyuz starts its de-orbit burn to slow the spacecraft down as it gets closer to Earth. The burn goes on for four minutes and 37 seconds. Mission control in Moscow report that the parachutes have been successfully released, and the crew are tightly strapped in for landing. Touchdown is confirmed at 10.15am. 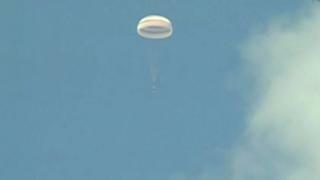 Tim Peake, Tim Kopra, and Yuri Malenchenko have a successful landing in Kazakhstan. A special team pull the astronauts out of their cramped spacecraft. The astronauts can finally take a moment to relax after their bumpy ride. "The Earth smells really strong"
Tim is back on Earth! He tells journalists that the Earth smells really strong, and he'd like some cool rain because he's too hot in his suit. And what about the journey? - "It was incredible. The best ride I've been on ever. Truly amazing. A life-changing experience." 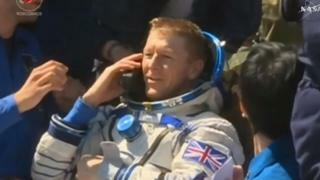 Tim Peake: How do you safely return to Earth from space? What's Tim Peake's mission in space?